Enjoy an exotic island hopping tour around Phuket’s best aboard a luxurious catamaran! 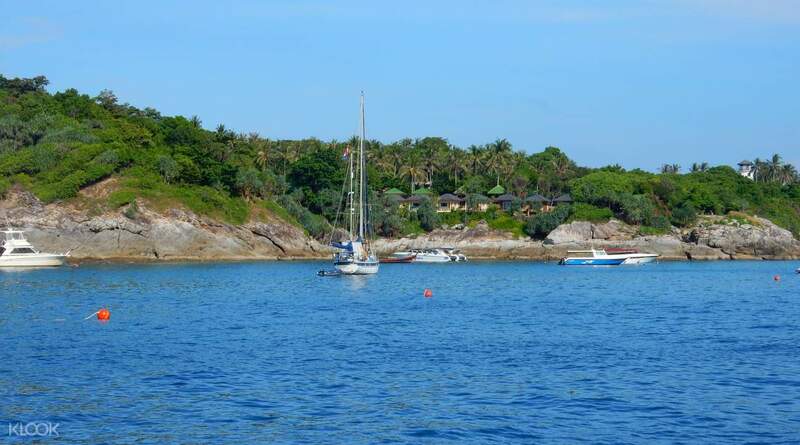 Discover Koh Racha Yai and Racha Noi Island Sunset Day Tour with Snorkeling by Motor Yacht for more island escapes! My tour guide, Dong An was very friendly and tried to help us all the time. The yacht was wonderful and all crews were friendly and nice. For the luch it was embrassed since there were only Chinese food. it seems that all people but us were Chinese. So we were little surprised. It would be wonderful if the agency thought this through for us. However our tour guide was really helpful and she really took care of us well. All program was very satisfied thanks to her. It’s time to make your dream island getaway a reality! Experience the ultimate escapade to Phuket’s best beaches and islands. Sail across the beautiful Andaman sea to explore Racha Island and Coral Island aboard a luxurious catamaran! Prepare for the exotic natural splendor above and below the sea in this incredible island hopping day tour. Start with a convenient hotel pick up in Phuket and arrive at the pier. 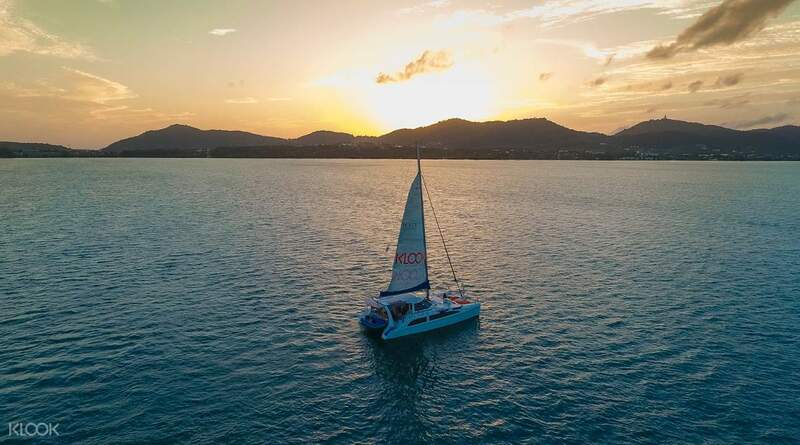 Sail through the Andaman sea on one of the world’s most awarded cruising and charter catamarans. Feel the sea breeze and marvel at the stunning ocean and island views. Arrive on Coral Island to enjoy thrilling activities such as riding a banana boat, speedboat, kayaking, or parasailing! The fine white beaches also offers a great spot for sunbathing and basking in the warm waters and ambiance of the island. Afterwards, set course to Racha Island. On the way there, relish in a sumptuous Thai lunch prepared by an experienced hotel chef. Upon docking, choose to explore vibrant marine life underwater by snorkeling for free or availing the sea walking package. Gaze in wonder at various sea creatures and colorful coral reef kingdoms as you dive down to the ocean’s depths. Finally, as you sail back to port, catch a spectacular Andaman sunset while sipping on a sparkling glass of champagne. This tour ends with your safe return at the hotel after a day of indulging in the tropical wonders of Phuket. 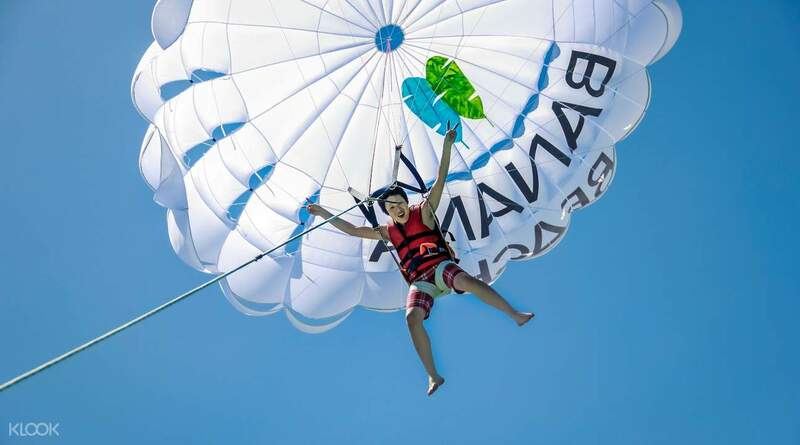 Dare to reach the skies of Coral Island by parasailing! My tour guide, Dong An was very friendly and tried to help us all the time. The yacht was wonderful and all crews were friendly and nice. For the luch it was embrassed since there were only Chinese food. it seems that all people but us were Chinese. So we were little surprised. It would be wonderful if the agency thought this through for us. However our tour guide was really helpful and she really took care of us well. All program was very satisfied thanks to her. My tour guide, Dong An was very friendly and tried to help us all the time. The yacht was wonderful and all crews were friendly and nice. For the luch it was embrassed since there were only Chinese food. it seems that all people but us were Chinese. So we were little surprised. It would be wonderful if the agency thought this through for us. However our tour guide was really helpful and she really took care of us well. All program was very satisfied thanks to her. Unfortunately the catamaran had maintenance but they did upgrade us too the more expensive Yacht which was a great experience The customer service is slow so don't expect any immediate responses if changes are made to your plans. They best way to resolve changes is to call the local operator at the bottom of your email. 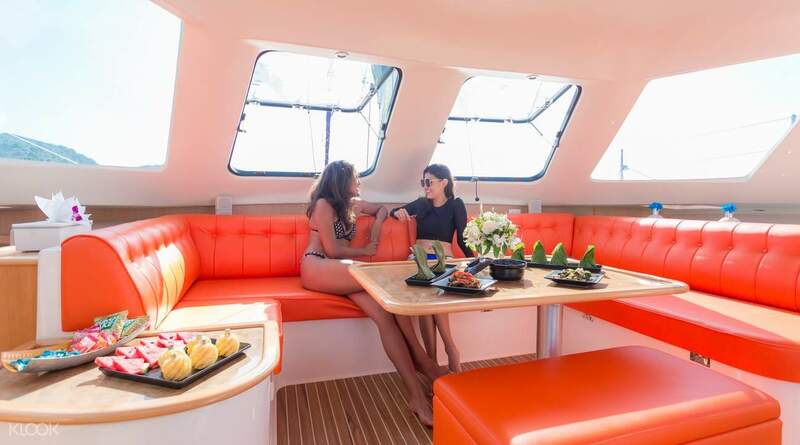 Unfortunately the catamaran had maintenance but they did upgrade us too the more expensive Yacht which was a great experience The customer service is slow so don't expect any immediate responses if changes are made to your plans. They best way to resolve changes is to call the local operator at the bottom of your email. The photos shown are not the catamaran you set sail on!! Huge disappointment!! The breakfast is not worth the mention, some weird biscuits and sliced bread with butter and jam. This tour catered for the Chinese and that was the spoken language for the iternary. We did however, have a guide who explained things to us afterwards, but it was difficult to hear as the Chinese were then talking between themselves. The photographer and photos taken on board with the Chinese felt like a portfolio shoot and was unsettling whilst trying to relax. The lunch was fabulous and the beaches amazing. The sunset wasn't viewed on board and the parasailing and banana boating were an additional cost. Whilst we had a great time, the description of this tour is grossly inaccurate and needs to be changed! The photos shown are not the catamaran you set sail on!! Huge disappointment!! The breakfast is not worth the mention, some weird biscuits and sliced bread with butter and jam. This tour catered for the Chinese and that was the spoken language for the iternary. We did however, have a guide who explained things to us afterwards, but it was difficult to hear as the Chinese were then talking between themselves. The photographer and photos taken on board with the Chinese felt like a portfolio shoot and was unsettling whilst trying to relax. The lunch was fabulous and the beaches amazing. The sunset wasn't viewed on board and the parasailing and banana boating were an additional cost. Whilst we had a great time, the description of this tour is grossly inaccurate and needs to be changed! the lovely Island of Phuket, a days rest was required and I was recommended this trip. we were collected from our Hotel until the return, it was a perfect day a delicious lunch on board. Everyone thoroughly enjoyed. High recommend!! the lovely Island of Phuket, a days rest was required and I was recommended this trip. we were collected from our Hotel until the return, it was a perfect day a delicious lunch on board. Everyone thoroughly enjoyed. High recommend!! begin the day, we went out on the Catamaran in the morning, The captains and hosts took very good care of us all day long with food, drinks and comfort provided. I highly recommend as good care of everyone by ensuring everyone is happy and comfortable. I had the most amazing experience. begin the day, we went out on the Catamaran in the morning, The captains and hosts took very good care of us all day long with food, drinks and comfort provided. I highly recommend as good care of everyone by ensuring everyone is happy and comfortable. I had the most amazing experience. A wonderful day trip for us with fabulous boat and high level service. The day was spent cruising and snorkeling and watersports activities (all equipments were on board), delicious lunch, all day snacks and drinks. recommend!!! A wonderful day trip for us with fabulous boat and high level service. The day was spent cruising and snorkeling and watersports activities (all equipments were on board), delicious lunch, all day snacks and drinks. recommend!!! This day trip is worth every single penny plus a million more! The boat was modern and comfortable, the crew were funny, informative, kind, and supportive throughout the entire trip, the snacks, drinks and lunch were delicious and filling. The view for lunch was absolutely out of this world beautiful. I HIGHLY recommend this tour/excursion. You are a fool if you don't take this trip of a lifetime!! The islands are some of the most amazing natural things I have ever seen!! The water is clearer than clear. I would take this trip over and over and over, if I could! Simply AMAZING!! This day trip is worth every single penny plus a million more! The boat was modern and comfortable, the crew were funny, informative, kind, and supportive throughout the entire trip, the snacks, drinks and lunch were delicious and filling. The view for lunch was absolutely out of this world beautiful. I HIGHLY recommend this tour/excursion. You are a fool if you don't take this trip of a lifetime!! The islands are some of the most amazing natural things I have ever seen!! The water is clearer than clear. I would take this trip over and over and over, if I could! Simply AMAZING! !